Perhaps the most intriguing film outing for James Bond, On Her Majesty's Secret Service is the first Bond film without Sean Connery, unknown actor and model George Lazenby stepping into the role for what proved to be a single stint. 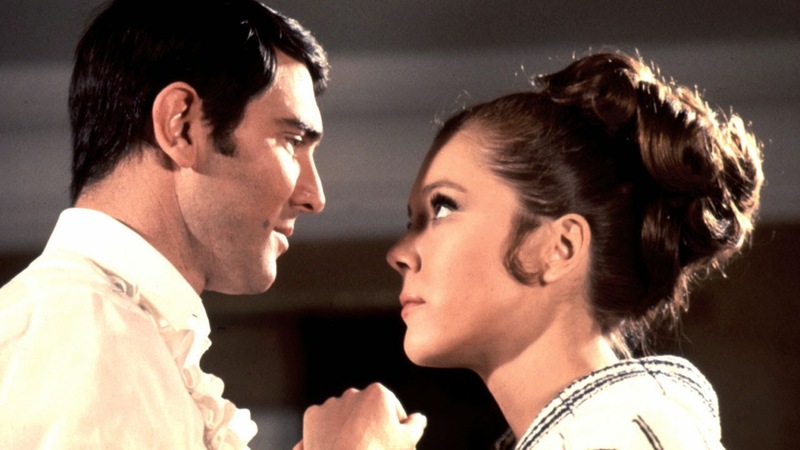 More importantly, the film features the agent's one and eternal love story, a heartfelt romance enlivened by Diana Rigg as Countess Tracy di Vicenzo. James Bond (Lazenby) saves a mysterious woman, later revealed to be Teresa (Tracy) di Vicenzo (Rigg), from intentional drowning on a secluded beach. He meets up again with Tracy at a casino, where he covers her reckless bet. Bond meets Tracy's father Marc-Ange Draco (Gabriele Ferzetti), the head of a major crime syndicate attempting to transition into a semi-respected industrialist. Draco suggests that Bond should marry Tracy. Bond resists but requests that Draco help him identify the whereabouts of master criminal Ernst Stavro Blofeld. With Draco's help Bond breaks into a lawyer's safe and learns that Blofeld (Telly Savalas) has assumed the name Comte de Bleuchamp, and has taken up refuge high up in the Swiss Alps, apparently operating a scientific research centre to cure food allergies. Bond assumes the identity of genealogist Sir Hilary Bray (George Baker), and travels to the research centre ostensibly to confirm Blofeld's claim to the title of Comte de Bleuchamp. He finds Blofeld hatching his latest plot to blackmail the world using a bevy of clueless international beauties, and well protected by an army of machine-gun toting gunmen, and the ruthless Irma Bunt (Ilse Steppat). Bond escapes from Blofeld's clutches and after a breathless ski chase down the mountain, Tracy makes a sudden appearance and helps Bond in his getaway. With Draco's help, Bond has to find a way to foil Blofeld's plot, while his romance with Tracy grows into a serious and deep love. With limited locations and a strong focus on romance, On Her Majesty's Secret Service aims for depth rather than breadth. Peter Hunt, in his only Bond directorial outing after many editing assignments, insisted on staying close to Ian Fleming's original novel, and the result is faithful to Fleming's vision of a conflicted, often overwhelmed and sometimes vulnerable agent. At 140 minutes, this is one of the longest Bond movies, and Hunt takes his time building a character-driven story. There are nevertheless some troublesome gaps in the narrative. Tracy's initial excursion into the ocean, and the goons who intervene once Bond saves her, remaining a puzzling mystery. As well, Bond has an opportunity to finish-off a tree-bound Blofeld, but inexplicably ignores it. But most of the other pieces of the film tidily contribute to an in-depth mission. On this adventure Bond is gadget-free, and lacks support from MI6, almost walking away from his job before pursuing Blofeld on vacation time. He is frequently on the back foot, as he loses several battles, and requires a second try to instigate an escape. Tracy comes to the rescue as Blofeld's forces almost overwhelm Bond at the Swiss village, and still Blofeld gets the better of a chase thanks to an avalanche. With Bond at a notable disadvantage, On Her Majesty's Secret Service most closely resembles From Russia With Love, and the insertion of George Lazenby into the role becomes strangely suitable. Lazenby often looks worried, an emotion rarely associated with Connery and Moore, but here nailing the reality of an agent cut loose from his agency and realizing that his foe holds all the cards. Lazenby's overall performance is inconsistent, his stance often stooped and uncomfortable. 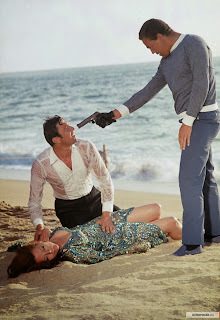 But in face to face scenes with M, Blofeld, Draco and Tracy, Lazenby's willingness to demonstrate feelings elevates Bond to a real person rather than a superhero. Diana Rigg finds the appeal in Tracy as a troubled, seductive and resourceful partner for Bond, a woman transitioning from rebellion against her father's dark empire to creating a positive place for herself in the world. Bond was only ever going to fall in love with a woman fighting her own set of demons and taking it out on the world, and Rigg finds the right balance between demanding independence and craving to be dominated. The action centrepiece of the movie is the long ski pursuit down the mountains, Bond attempting to flee but unable to shake his pursuers. That Blofeld himself leads his men increases the intimacy of the conflict. This is not a villain confined to his extravagant command centre. 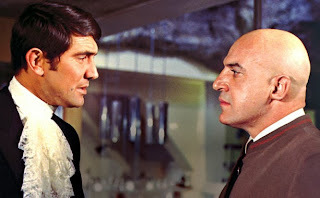 Telly Savalas transforms Blofeld into a take-charge-when-needed leader, finally personalizing the long-running duel with Bond. A one-off actor portraying a Bond in physical and emotional peril, On Her Majesty's Secret Service is an invigorating ski run.